In a report issued today, the National Audit Office has concluded that government attempts to save money by sharing ‘back office’ services such as finance and human resources have actually ended up costing more money than they have saved. It appears that by creating complex services overly tailored to individual departments, the five shared services centres review by the NAO have increased costs and reduced flexibility. There has also been a failure, the report says, to develop the benchmarks necessary for measuring performance. The five centres, which were set up between 2004 and 2011, were due to cost £0.9 billion but have so far cost £1.4 billion. They have also not achieved the planned benefits. By the Government’s own estimates, they should have saved £159 million by the end of 2010/11, yet only one can demonstrate a break-even on its investment. The two centres still tracking benefits report a net cost of £255 million. So why have these centres, which look so good on paper, failed to work out in practice. The report identifies a number of reasons. 1. The departments involved have not acted as ‘intelligent customers’. They have not sought to obtain detailed information on costings and benchmarks and have not tried to identify the key drivers of cost, which would have helped them to monitor progress and improve efficiency. 2. The services have been overly customised to individual departments. This has meant that the shared services centres have not been able to achieve the economies of scale that come with standardisation of processes and volume of activity. 3. The centres have not had a sufficient focus on improving efficiency. They have been working to get more customers on board, but have not paid enough attention to driving efficiency for their existing client base. 4. The IT systems used have been overly complex and expensive. The centres have set up top-of-the-range enterprise resource planning systems that provide far more functionality than is required. Simpler systems would have been more appropriate – and much cheaper. 5. There has been poor take up of the centres. The sharing of services is voluntary and many parts of central government have chosen not to use the centres, but rather to keep their corporate services in house. This means that some centres have significant spare capacity and have not been able to benefit from the anticipated economies of scale. 6. There has been limited challenge to the centres’ performance. With little in the way of central oversight and a lack of cost and performance benchmarks, it was left to individual departments to make sure that the arrangements delivered what they were supposed to. 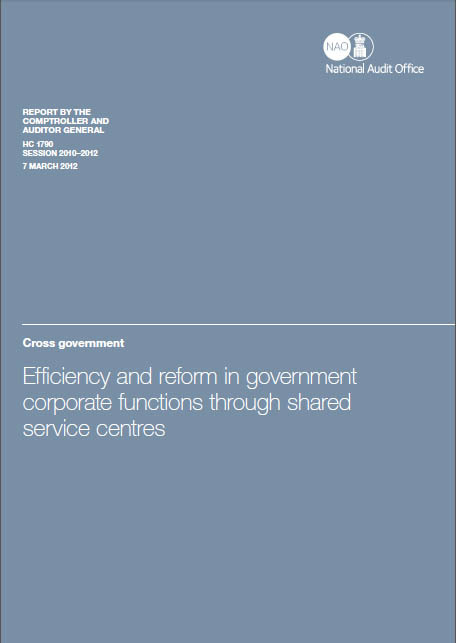 The report concludes that the Government’s shared services initiative has not delivered value for money for the taxpayer. However, the NAO welcomes the Government’s commitment to addressing the weaknesses it has identified, with the Cabinet Office now taking overall leadership of the programme and planning to roll it out across the whole of central government by 2014. This is an ambitious strategy, but probably a necessary one if the potential benefits of sharing corporate services are to be realised not just in theory, but also in the real world. This entry was posted in Business Process Design, Cost Analysis, Financial Management, Performance Improvement, Strategy, Value For Money and tagged Corporate Services, Cost Analysis, Cost Reduction, Costs, Efficiency, Financial Management, News, Performance Improvement, Shared Services, Strategy, Value for Money by Simon Perks. Bookmark the permalink.